Last night I revisited one of my family’s favorite recipes in my cookbook Made in America – Barbara Lynch’s Rigatoni Carbonara – and I adapted it using spaghetti – I prefer twiddling the coated pasta around my fork! This easy mix of bacon, eggs and pasta is quick and easy to make for a satisfying supper that we all really enjoyed. Now I have a bowl of leftovers for lunch I’m wondering if the recent news out of the UK about reheated leftover pasta being less fattening might be a win win situation… basically scientists in England discovered that reheating pasta led to a dramatically decreased glucose spike than when eating pasta as we normally do. 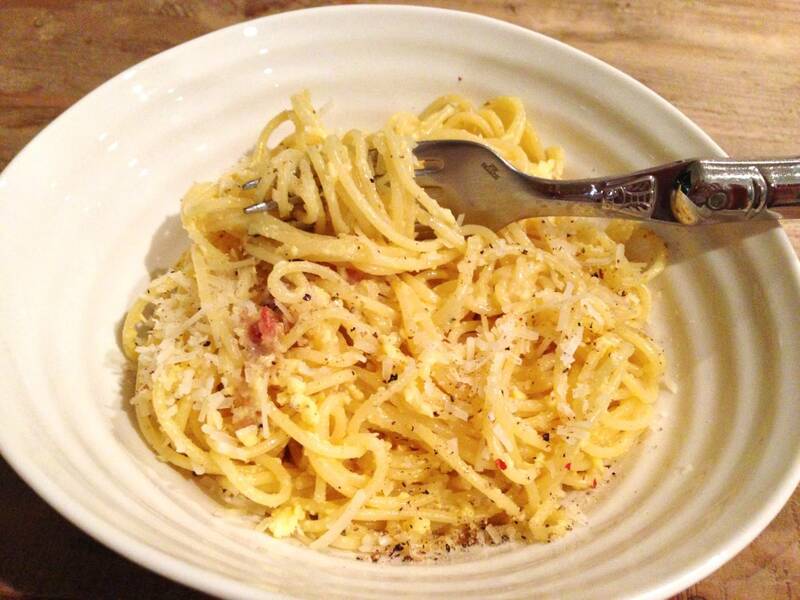 Here’s Lynch’s recipe and an excerpt from Made in America – I used Parmesan Reggiano and Pecorino Romano cheese and spaghetti. Italian’s don’t do elaborate breakfasts, a quick espresso coffee and a small pastry at a little bar before hoping back on a Vespa is the norm. However, I’ve always thought that the way they make up for this by eating the typical breakfast food of bacon and eggs as carbonara, just not first thing in the morning. Don’t we all really want to eat breakfast at every meal? 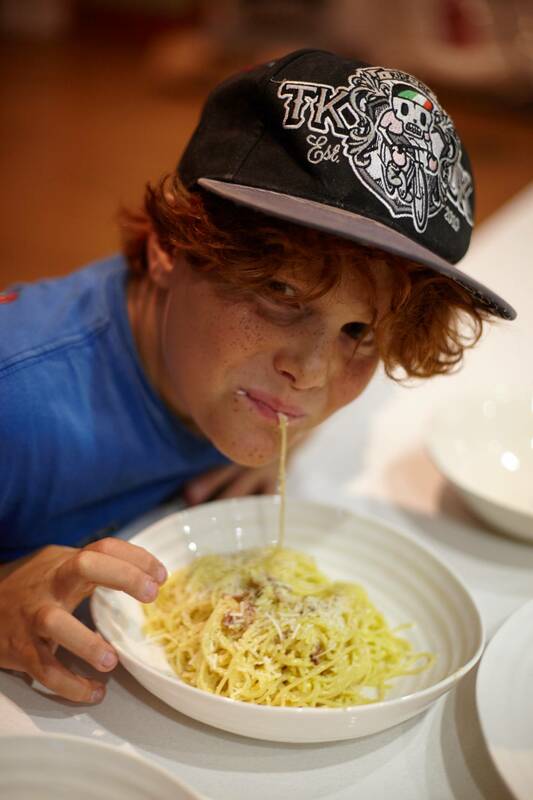 American’s have adopted this Italian dish and it’s brother, Alfredo. In America both these dishes are commonly made with the addition of cream and more sauce than the original Italian versions. Barbara Lynch, renowned Boston chef and restaurateur, keeps it Italian, —no cream, and she adds the hot pasta to the raw eggs to cook them. Lynch is the recipient of numerous accolades, including a James Beard Award—she is a major culinary force in Boston and beyond. Located in the historic neighborhood of Beacon Hill, the first of her many restaurants, No. 9 Park provides an intimate, European-scale setting in which to enjoy Lynch’s refined cuisine—an artful blend of regionally-inspired Italian and French dishes, with an emphasis on simplicity and flavor. 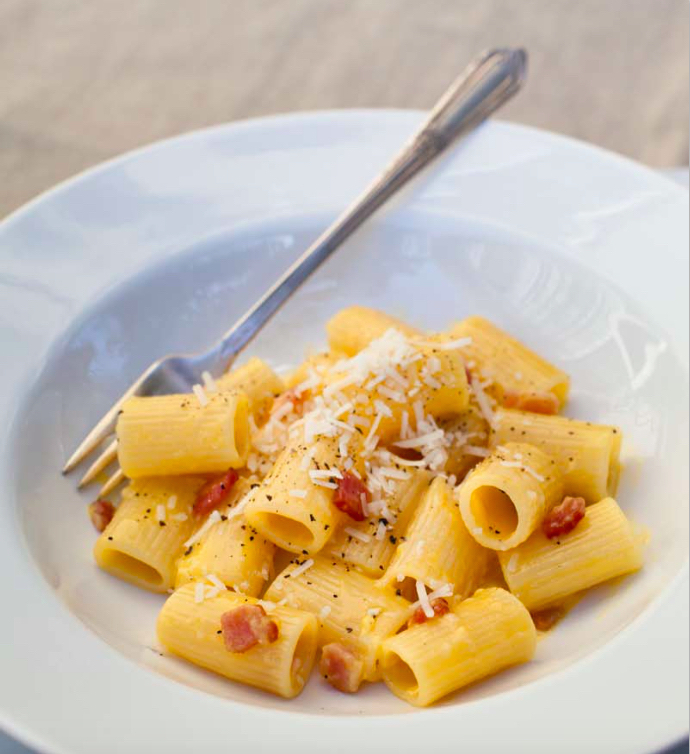 Lynch’s carbonara is made with rigatoni—a large cylindrical noodle, and seasoned with three different kinds of peppercorns. The rich creamy sauce that coats the pasta, with lots of black pepper and the salty morsels of guanciali, is proof that simplicity is often the best way of achieving the most satisfaction, both in the cooking and in the eating. 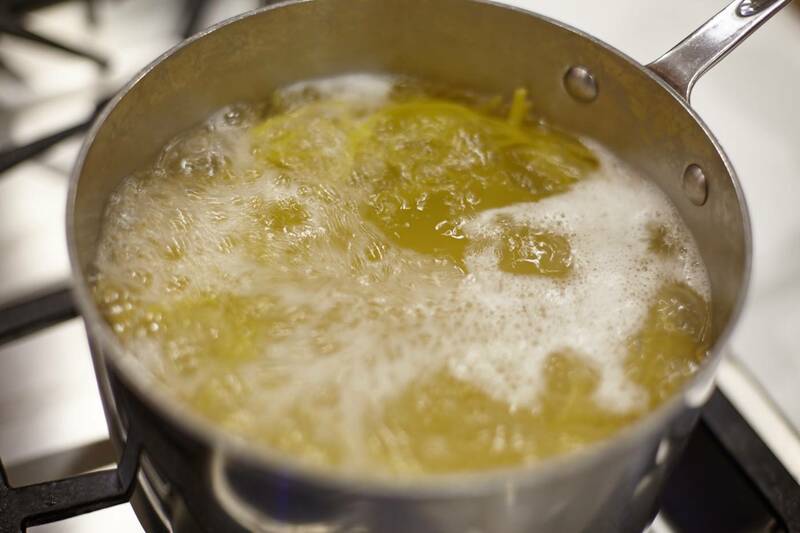 Bring a large pot of cold salted water to a boil, drop in pasta and stir. Cook for about 15 minutes until al dente and strain. 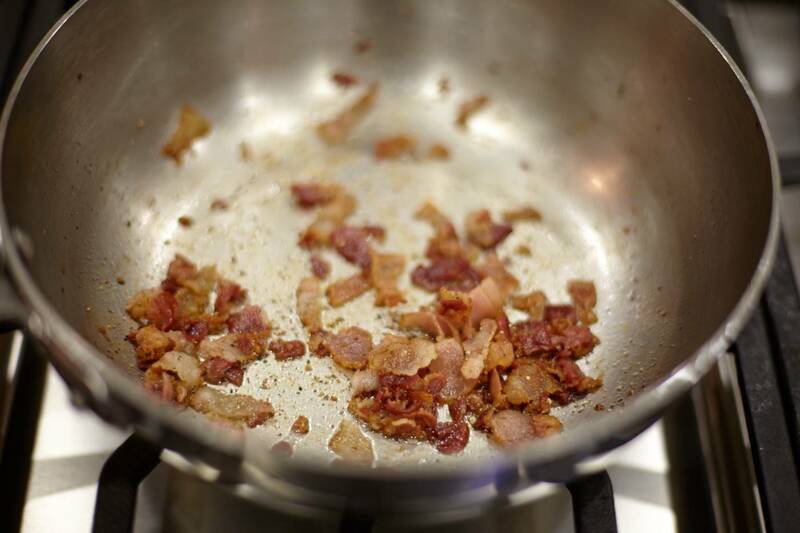 Meanwhile in a large mixing bowl whisk eggs lightly with a fork and add the cooked guanciali. Gradually add strained hot pasta and then cheese. Mix until sauce is nice and creamy. Add salt and pepper. Place in 4 bowls, garnish with a bit more cheese and enjoy!